**Araatris:** “Oh, I know what you have, Raddok. I’m interested in how you got it.” Rhese rests his hands on his hips, smirking at the goblin smuggler. **Araatris:** The night elf grins. “Of course I can. How much?” Tsume glances up at him as he idly straightens the borrowed bow and quiver over his shoulder. **Rhoelyn:** Raddock rubs his hands together. “A thousand gold should cover mah expenses. Though de longer we talk…” He lets the suggestion hang. **Araatris:** Rhese raises his silver brows. “A thousand? That’s th-” “Price just went up to ten-fifty, hunter.” The goblin leers as his customer glances away. **Rhoelyn:** “Com’on. I ain’t got all day.” Raddok turns and starts digging in a crate “Better. Come back with ya gots the money.” He smirks to himself. **Araatris:** “Very shrewd of you. Tell me where you got the mana eaters.” He pulls out crumpled papers, glancing at them and tucking them in his own pouch. **Araatris:** Rhese glances over. He pats the goblin’s shoulder before he stands and retrieves the book. After flipping through it, he clicks to Tsume. **Araatris:** The curses the little goblin throws in his direction only become more foul when the druid looks up at the sky, his eyes flaring with power. **Rhoelyn:** A moment later, a white streak impacts where the mana eaters are held. Their screeches herald their death as Rhese pushes into the forest. **Araatris:** The druid pats the wolf trotting by his side. “Thanks, little sister,” he says. Nysse steps out of the shadows, preceded by a throbbing red glow. **Rhoelyn:** “We need to check-in. He’s likely getting anxious, surfal.” She presses the stone in his hands as she reaches for her bow and quiver. **Rhoelyn:** The huntress settles her bow with a sigh of relief. Tsume brushes against their legs as Rhese activates the stone, a gruff male voice answering. **Araatris:** “Not likely.” His voice is grim. “Go in hot.” Rhese nods, not that the spymaster can see. “Understood.” He dims the stone, handing it to Nysse. **Rhoelyn:** “You heard the man.” The druid shifts into a sleek, silver cat. She crouches and rests her hands on both her furry companions. The stone glows. **Araatris:** The city that resolves itself around them as the magic fades is one in chaos, buildings built in massive trees burning with green felfire. **Araatris:** Rhese yowls as he sprints toward another pair of felguards menacing a sentinel just a short distance away, leaping on one with claws extended. **Rhoelyn:** His claws dig into its leg. The demon falls to one knee as the sentinel slashes across its chest. She ducks the axe of the other felguard. **Araatris:** Rhese glances back at Nysse in the instant before he leaps on the second felguard’s back, taking a great, nasty bite of his hulking neck. **Rhoelyn:** Nysse shouts another command as the felguard catches Rhese’s paws, causing him to stumble but not fall. He rakes his claws down its back. **Araatris:** The sentinel takes advantage of its distraction to shove her weapon through its neck. The druid leaps free as it falls and Nysse’s arrows sing. **Rhoelyn:** Another arrow pierces Nysse’s opponent as Tsume bites his sword arm. The felguard gurgles and Nysse steps back, covering her mouth and nose. **Rhoelyn:** Nodding, Nysse whistles and darts towards her parents’ apartment at the city edge. Tsume stays close as they dart between and around demons. **Araatris:** Darnassus is a nightmare. The normally tranquil city echoes with screams and growls and shouts, brutal demons of every shape and size everywhere. **Rhoelyn:** Nysse’s stomach churns and she once again covers her face against the pungent smells with a groan. She scans the area for her family. **Araatris:** A chittering imp scampers toward her and Tsume, calling in a high-pitched voice for its equally-repulsive buddies to join it. Three more advance. **Rhoelyn:** Clenching her teeth, Nysse draws her bow. Tsume snarls and leaps forward following her arrows. She hears Yami’s familiar yip close by. **Rhoelyn:** Tsume pounces on the last imps, allowing the huntress to listen. “Clear!” Her gaze locks on a building corner and she clicks at Tsume. **Araatris:** With quick, efficient motions, the wolf ends her prey and races to Nysse’s side, taking point. The sound of metal chiming against metal rings. **Rhoelyn:** Skidding around a corner, Nysse assesses the chaos. Celara’s blade meets an eredar’s while Sarren and the wolves harass an eredar warlock. **Araatris:** Her father’s whistling arrow dissolves into ash when the warlock gestures, but Yami darts under his guard, his form that of a massive, black wolf. **Araatris:** The boy-wolf releases him immediately, ducking low and dodging back to his grandfather’s side even before his head swivels to find Nysse. **Araatris:** The huntress’ arrow sticking out of his eye, the warlock collapses. Celara glances over, but only briefly as she blocks another strike. **Rhoelyn:** Sarren fires an arrow at his mate’s opponent, shouting, “Yami! Nora! Hold!” Both wolves run and snap at the eredar’s arms. Nysse straightens. **Araatris:** She drags her bow around, trying to ignore the stench of blood and smoke. Sarren’s arrow jerks the target forward and hers knocks it back. **Rhoelyn:** Celara thrusts her sword through the female eredar’s chest. The demon falls with a gasp, sliding off the blade. The huntress swallows hard. **Araatris:** The boy smiles brightly, wiping blackish demon blood off his cheek. “Family protects each other!” he says. Sarren approaches them. **Rhoelyn:** The huntress hesitates. “We should wait for Rhe-” “I’m here, Nysse. Some imps held me up.” Rhese strides towards them and gives Yami a hug. **Araatris:** He looks from them to the city around them, frowning. “I don’t like it. Everyone is scared or hurting or sad.” Celara rests a hand on his back. **Rhoelyn:** Nysse offers him a tight smile. “You’re right. Why don’t you and Yami lead the way? I’ll cover the back with Tsume.” She readies her bow. **Araatris:** Her parents exchange a worried look as Rhese nods and slides Yami to his feet. They both shift into their four-legged forms and dart forward. **Rhoelyn:** They follow behind him, following their darting forms. The small group carves a path through the demons, gathering a few other families. **Araatris:** When a tough felhound finally falls, Nysse steps over to a damaged wall as the others press forward, retching. A hand rests on her shoulder. **Araatris:** The huntress gulps, nodding. “Good, little star. Now hurry along. Your boys are impatient.” He smirks up at where Rhese and Yami range forward. **Araatris:** They make their way deeper into the city, the group around them growing. As they rest for a few minutes near the ruined inn, Rhese paces. **Araatris:** Her mate starts to pull her into his arms, but her face turns distinctly green to match her hair when she catches a whiff of his bloodied armor. **Araatris:** Rhese watches her with a furrowed brow. “Lovel-” He’s interrupted when the blindfolded woman taps his shoulder, a warglaive in her other hand. **Araatris:** The huntress nods, but Rhese does indeed look extremely unconvinced. “You can ride, lovely. I c-” She interrupts him by shaking her head. **Rhoelyn:** The huntress hesitates, but takes his hand and steps closer. “I-it’s the demon blood on you. It’s… pungent.” She grimaces as she hugs him. **Rhoelyn:** Sighing, she reluctantly agrees. “I will. I hope we can rest soon. There’s been so much to do.” She rests her head tiredly on his shoulder. **Rhoelyn:** Nysse bites her lip. “Do you think…” She tenses as the nausea hits her again. “Do you think I could ride? I can run, but…” She trails off. **Araatris:** The smirk he levels at her pretty clearly says that she might just be ridiculous. But he just nods. “Of course you can, lovely.” He steps back. **Rhoelyn:** Her blush is bright on her pale cheeks. She watches her mate shift into a stag. He noses her, and she smiles before climbing on his back. **Araatris:** When the purple-haired demon huntress swings by them, calling for the group to get moving, she slants Nysse an amused grin. Yami pads up. **Rhoelyn:** Nysse looks away. “Are you ready, sweetie?” The wolf bobs his head. “Stay near us.” She leans forward, hugging Rhese as they start to move. **Araatris:** Their family stays close together as they move, guarding one of the flanks of the ever-growing group. Celara yanks her sword out of a succubus. **Rhoelyn:** Sarren and the wolves range out, killing imps. Straightening on Rhese’s back, the huntress sends her arrow to silence an eredar caster. **Araatris:** The stag watches and only bounds in to the fray when a pair of felhounds and their handler rush at them. Nysse has to lower her bow and hold on. **Rhoelyn:** His antlers catch one felhound and tosses it to the side, then kicks out at the other demon. Rhese’s mate cringes as her stomach lurches. **Araatris:** The second hound manages to dodge him and darts around to leap on his flank, gouging with its claws and snapping at Nysse. Rhese snorts, pained. **Rhoelyn:** Nysse rolls off his back, tumbling on the farside from the felhound. “Rhese, change!” The huntress jumps to her feet and raises her bow. **Araatris:** The druid’s form folds immediately, and he roars as a bear, throwing his weight against a thick tree and smashing the hound, stunning it. **Rhoelyn:** An arrow pierces its eye and it slumps, dead. The felhound handler draws his blade as they turn to him. Nysse carefully lines up another shot. **Araatris:** Rhese shifts into his cat form, yowling as he dashes toward the handler, a creature that appears to be the same race as the hulking felguard. **Rhoelyn:** The huntress releases a shrieking arrow ahead of Rhese. “We need to keep up!” His claws quickly follow digging into the fel creature’s abdomen. **Araatris:** When the handler shrieks in pain, there is an echoing chorus of felhound howls that has their blood running cold. Rhese cuts him off by choking him. **Rhoelyn:** Felfire explodes, knocking them off their feet as an infernal crashes between them and the main group. Nysse instinctively curls up, rolling. **Rhoelyn:** Coughing, she uncurls and shouts, “I’m fine, Rhese!” Nysse struggles to her feet. “We need to circle around!” She gags at the burning scent. **Rhoelyn:** The huntress nods and starts a stumbling run. “Make sure you do!” Behind her, Rhese summons vines to try and restrain the massive rock demon. **Araatris:** Straining, his power flares as he kneels, dragging waves of thicker and thicker vines from the fertile ground of Teldrassil. The demon struggles. **Rhoelyn:** A shadowy figure appears above and brings a burning glaive down on the infernal’s head. As the head shatters, Tris lands in front of him. **Rhoelyn:** Snorting, the demon huntress grins. “Then you better– hey!” Rhese shifts, his feline form racing towards Nysse. Tris chases after him. **Araatris:** The huntress looks relieved as the sleek, silver cat dashes up. At her side, his form expands into the stag, and she grabs an antler to swing up. **Rhoelyn:** Nysse huddles on Rhese’s back as he leaps over debris from damaged buildings. 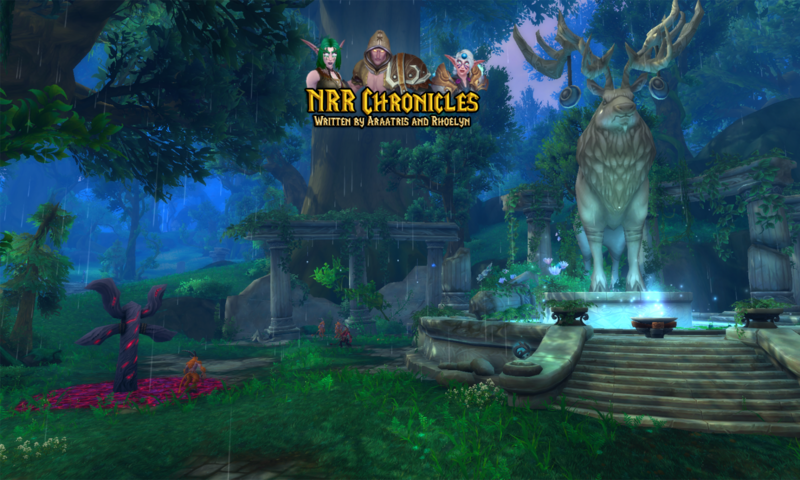 The temple of Elune is in sight and they near the the side ramp. **Araatris:** Refuge seekers crowd the outer grounds of the temple, surrounded by a ring of protectors as well as another ring of demonic attackers. **Rhoelyn:** The demon huntress and sentinels push to the front, creating a gap for the refugees. Rhese’s hooves hit the stone just outside the temple. **Rhoelyn:** “Yami can go in and find Rhoelyn. I should stay and help you out here, surfal,” The huntress protests even as Tsume and Yami stare at them. **Rhoelyn:** Nysse bites her lip and steps in for a hug. “Please be safe, Rhese.” She buries her face against his shoulder trying to fight an urge to cry. **Rhoelyn:** The huntress nods. “I love you and we’ll see you soon.” Yami shifts into a boy and Nysse gathers him in her arms as they head into the temple. **Araatris:** People mill everywhere in the verdant temple, sitting or laying as they’re able in the halls, along the verandas, and in the central grotto. **Rhoelyn:** “I don’t like it.” Yami buries his face against her and she sighs. “I know. It’s hard.” She rests one hand and waves at a passing priest. **Araatris:** “Min’da’s sick,” Yami volunteers, glancing up even as the huntress shakes her head. She blushes. The priest blinks and stares at his dark eyes. **Araatris:** “He’s very busy, Yami.” His mother counts doors, tugging open the third one to find a storeroom full of herbs drying on racks and stored in sachets. **Araatris:** Yami skips forward gleefully, smiling. “I’ll help, min’da. Don’t barf!” He starts rifling through a cupboard before she can say anything. **Araatris:** He peers at Nysse for a moment before turning back to the cabinet. “They have a lot, here. I’ll get you two.” Yami snags a second sachet. **Araatris:** He does, and she puts a little more distance between herself and the room before she settles against the wall, sitting for a minute. **Rhoelyn:** Yami snuggles next to her, offering the sachets. “Thank you, my light.” Nysse takes them and opens one, taking a few of the herbs within. **Araatris:** A familiar voice intrudes as Nysse tugs out her canteen. “Just the one, sister.” Rhoelyn smiles warmly, if tiredly, at them both as she approaches. **Araatris:** The priestess’ brow furrows, and she looks her sister up and down, her eyes bright with magic. Her eyes widen at first, but she quickly recovers. **Rhoelyn:** Nysse looks a little sheepish. “I’m not that bad. Those would have been fine, sister.” She covers her face as Rhoe steps to the herb room. **Rhoelyn:** Chuckling, Nysse smiles tenderly. “It’s alright. I’m not sure I could eat yet anyway.” She tucks away the sachets and stands, grimacing. **Araatris:** The priestess giggles and takes her hand. “Come. I’ve just the place for you.” She pats Yami’s shoulder as she drags them farther down the hall. **Rhoelyn:** Nysse laughs, “I’m coming, but Rhese will wonder where I went at this rate.” They turn a corner and Rhoelyn opens a door half way down. **Araatris:** Luckily for Nysse’s stomach, the kitchens are mostly cold and abandoned through the emergency. The priestess indicates seats at the worktable. **Rhoelyn:** The huntress sits, Yami taking the seat next to her. Nysse props her chin on her hands, resting her eyes, as Rhoelyn searches the cabinets. **Araatris:** As she rummages, she mumbles, “Are you hungry, darling boy?” Yami giggles. “No, min’nu. Of course not.” She brings over a handful of dry bread. **Rhoelyn:** The young huntress nibbles at the bread. “Maybe. At least this doesn’t have much of a smell.” She sighs and takes a drink from her canteen. **Rhoelyn:** He smiles broadly. “I can make myself bigger so I can carry more.” The young pre-teen boy suddenly shifts into his late teens. Nysse chokes. **Rhoelyn:** “I’m not a troublemaker, min’nu! I’d… I’d just like to help like min’da and an’da are.” Yami ducks his head and grins. The huntress frowns. **Araatris:** The little healer leans forward and brushes his silver hair away from his temple, the two of them starting to look more like mirror images. **Rhoelyn:** “I will.” Yami shifts back to his pre-teen form and snuggles his mother’s side. Rhoelyn smiles and kisses their cheeks before slipping away.